Recently, I met a question from a help forum, in the thread, Lynn wrote, “I have a gorgeous PowerPoint presentation with animation and music, that I'd like to convert this PowerPoint presentation to movie format that is accepted by YouTube. Does anyone know of a way of doing that?” Many people posted their methods to Lynn. Different people have different ideas for converting PowerPoint to movie. For this reason, let me sum up ways to convert PowerPoint to movie file and analyze pros and cons for you. You can select a suitable PowerPoint to movie conversion method according to your needs. I think this is the best way to convert PowerPoint to movie file. Many PowerPoint to video converters provide the smart feature to convert PPT to movie formats. 1)	Download Wondershare PPT2Video pro and install it on your computer. 2)	Launch the program. 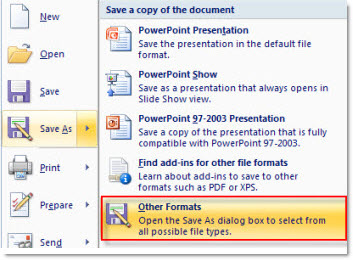 Click Add button to choose the PPT presentation you want to convert. Click Next. 3)	Set the output video settings for the movie you want to generate. And then click Next button. 4)	Click Start to begin your conversion from PowerPoint to movie. >> The published movie can retain the animations, transitions, sound and movie clips in the original PowerPoint file. >> You just need to pay $49.95 for Wondershare PPT2Video. Windows Movie Maker is a free video maker. With it, you can make awesome movies from PowerPoint that can be shared across the Internet. 1) Save your PowerPoint slide show as “PNG” images. 2) Import the images to your Windows Movie Maker in order. 3) Select all the imported images and then add them to Storyboard. 4) Add video effects to the slides. 5) Save the slide show as Movie File. No need to download other software. This tool is part of Windows operating system, so it is totally free. The transitions and animations in your original PowerPoint will disappear. An idea catches my eyes from this forum; Edward said, ”You can record your PowerPoint presentation with screen capture software, then save it as video file.” Yeah, this is another way for converting PowerPoint to movie for some people who have screen capture software on their computer. With this tool, you can record the playing presentation using its screen capture utility. Screen capture software like Camtasia now provides the PowerPoint capture feature to do the recording of PowerPoint presentation. 1) Open a PowerPoint presentation to record. 2) Select the recording options from the PowerPoint Add-in Toolbar. Click the Record button. 3) The presentation is opened in slide show mode. Then a Camtasia Studio dialog box will appear in the lower right corner of the screen. 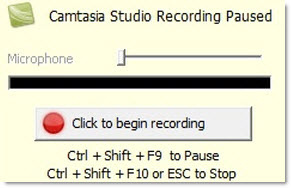 Click the Click to begin recording button. 4) Progress all the playing PowerPoint presentation slides. To stop the recording at the end of the presentation, click Stop recording. 5) Enter the filename and directory and click Save. The presentation recording will be saved as a Camtasia Studio recording file. The program can capture slide timing, animations, sound effects, webcam video and any applications displayed on screen during the presentation. The screen capture software with PowerPoint recording feature is quite expensive. As we know, Camtasia Studio costs $299. These 3 ways can help you convert PowerPoint to movie! If you know of other useful ideas to convert PowerPoint to movie, please let me know.